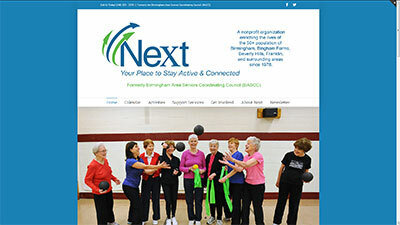 Active adults in the Birmingham, Michigan area have enjoyed the programs and support services offered at Next for over 37 years. This was a redesign and development project. The original site wasn’t that old. It was done in WordPress, but the folks at Next who had to maintain it were frustrated and unhappy. Next has a lot of recurring events. The calendar installed on the site didn’t handle those easily. Members wanted to pay for events online. But the site had no ecommerce functionality to achieve that. It also seemed sluggish when moving between pages. We took the current look—which they liked—and re-worked it to make better use of the screen real estate on desktop, tablet and smartphone. We added a lot of colorful images, including a big bold slideshow promoting their upcoming events on the home page. We installed and configured a very robust calendar. They now have the ability to charge for events, and folks can RSVP to free ones. The code that outputs both data and the design was completely re-done, and it’s much more efficient and streamlined. We made them a series of training screencasts, and they are now happily maintaining their site. I had the pleasure of working with drw Design while creating a new branding image for our 50-plus community center. We were looking to keep our website consistent with our new messaging and be a virtual window to all we do inside our building. 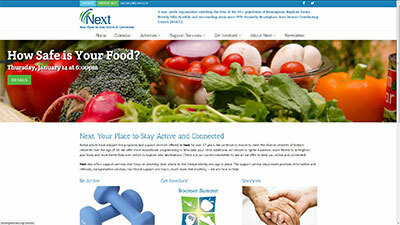 We wanted a very clean, current look that was easy to navigate and was very user friendly. Debra understood our vision and created a web site that exceeded expectations. We launched our site a few weeks ago and have received nothing but rave reviews. Our members and the community alike are finding the site very easy to use. It’s loaded with important content, information and has a calendar that works perfect with the amount of activities we offer weekly, plus it is visually beautiful and changes frequently to keep users returning. Debra was such a pleasure to work with – I would highly recommend drw Design to others, in fact I already have!